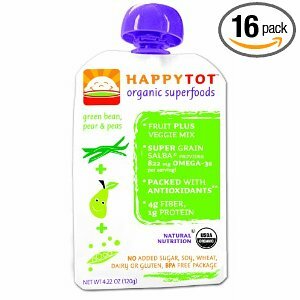 Get at least 31% off list price for HAPPYBABY Happy Tot – Stage 4: Green Beans, Pears and Peas, 4.22 Ounce Pouch (Pack of 16). The price is $19.20 or you can get them for $16.32 with Subscribe and Save . Remember that with Subscribe and Save you get FREE Shipping and can cancel at any time. Other flavors are also available. Free Smile Bright Teeth Whitening Pen Free for New SaveMore Customers! Saveology: $10 CVS Gift Card for just $6!